Well I have had a fun day. I've taken so many inspiring photographs, I can't wait to get home and get started on some of these designs. I had been looking at the wings of the plane bringing us over and I thought the plates and rivets had potential in a quilt, well it is a very patchwork effect. Today we went to the aircraft museum. Lots of rivets and other bits of metal to inspire me. I don't know if anyone would recognise the various planes, but I think they will make fun designs. The museum also turned out to be the location of choice for the various race related folk. We bumped into so many people we knew it was just silly. You really don't expect that many Brits in a not very big museum. It was nice to get to chat to some of them. From there we went on to Gamla Linkoping. This is a 1900 town that was moved from the center of the town to the outskirts where it could be preserved and maintained. I now understand what people mean by wide floor boards. The ones in some houses were huge. The paint effects in the Baron's house would have made great quilting designs, but I didn't like to take photographs and I hadn't taken a paper and pencil so I guess it won't be this year I use them I think I can remember one of them at least. I also talked to a lady who spins and knits, who has directed us to a factory/museum with a very old spinning jenny. I don't know if we will make it there this trip, but we may on a future one. We also went exploring. We do this, and hunt for ancient monuments, forts, and rune stones. Today we found a source of iron ore. It is very pretty with a little waterfall in a forest. We also had a chance to walk through the forest following animal trails. It is so different to London. It is nearly silent. Where we were there weren't even insects making noises. I took pictures of trees, insects, flowers and moss (you had to be there) so I should have improved my source library a lot. I doubt I will be able to blog tomorrow. Our flight leaves here after 9pm, so won't get to England until gone midnight. Hopefully I will have time to upload pictures Wednesday. So somewhat sunburned after two days racing (full report at Eurodragster) I have completed the hand sewing on two quilts, just leaving one to finish over the next two days. I have also been catching up on my quilting magazines. I found a new (to me at least) one in my local newsagents just before we left. It is called Quilter's Home, and I quite like it. It is a long way from your traditional magazine. It is almost a cross with a womans magazine, but has avoided the beauty tips and celebrity gossip. I don't like womens magazines but this was fun. I think I will look into getting a short subscription to see if it can keep it up. I've also had time to think about my new fabrics. From Tyger and Ting I got a fabric that wants to be a quilt pattern, and I realized I have most of the fabrics for that quilt right here. I am honestly trying not to work, but I love what I do so it just sort of happens. It will be very tricky to piece and as I fancy making it bed size I think it is going to take a while. I also figured out why I prefer bed quilts, other than the fact I like art with a purpose. It is because I don't have anywhere to display wall quilts. Making one pretty much is a statement that I won't keep it. So if I want it to be my quilt, it needs to be bed sized. Besides in this case I think it will make it a little easier. Yay, today blogger is showing me things in English. I know I want to improve my Swedish but that wasn't what I had in mind. We awoke to find the weather forecasters had it right. Rain, and lots of it. Given how expensive entry to the track is we decided not to bother on a day when we weren't likely to get a lot of racing. This meant we could have a lie in and then a leisurely breakfast. I like that what we call organic in the UK is called ecological over here. To me it makes a lot more sense, I find the idea of inorganic food bizzare. This hotel has many ecological products available for breakfast. Instead of going to the racing, we went back into the town. We had a little look around yesterday so we knew where some things were. We were able to lay in a stock of munchies and drinks. One of the things I love about Sweden is their fruit cider. I've tried the ones that get imported to the UK and they really aren't as good. The nearest shop had a range of about half a dozen flavours. perfect. We also picked up some Pepparkakor, these are very thin spicy biscuits. Great car snacks. We then needed a plan for the rest of the day. Yesterday Mia had given us details of another quilt shop, which I hadn't looked at, and feeling a bit guilty about dragging us off to another shop I let the guys come up with ideas. I am traveling with some great guys, they suggested heading off to the shop. What I hadn't realised is it was over 200km away. We were going to go most of the way across the country. I took some hand sewing with me and off we went. (yes we did think to call ahead to check they were open). The shop we were off to is called Tyger and Ting. On the way we got to drive through some great countryside. I did take some pictures on the way back so when I get home I will upload them and show you all. Sweden has great bones, there are lumps of rock all over the place. Also it is amazingly green, and full of lakes. Today were were driving along one of the big lakes, Vattern. It really is large, in places you can't tell it is a lake, it goes beyond the horizon. The road is sometimes down at the level of the water and at other high above it, so during the journey you get to see the lake from many angles. It is very inspiring. We found the shop easily, thanks to good signs from the nearest large road. It is housed in a lovely wooden building, and we managed to get from the car to th shop in a break in the rain, perfect. Wow what a shop, I wish it was closer. The range of interesting shaded fabrics and blacks was simply amazing. Obviously I bought as much as I could afford, but I am hoping she might soon offer a mail order service. I was particularly impressed by the fabrics with silver on them, it is rare to see that although gold is quite common. The prices even compared reasonably with UK prices, impressive. The couple who run the shop are both quilters, but he also makes wooden furniture. Now how exactly am I going to ship furniture back when I buy it? I am sure he could make me my perfect quilt display/storage units, and relative to shipping them from the US it would be cheap right? They also produce their own patterns, which were very interesting. A lot are simple but all clever with neat ideas and tricks. OK they are written in Swedish, but I can see me having to buy a few at some point. Annoyingly I forgot to buy the new magazine they had. It is the first Swedish quilt magazine and it looked good. I meant to buy a copy (it had advertising for shops :) but I can't even remember the name. Oh well I guess I will have to email and ask. On the way back we stopped off at a ruin we had seen on the way out. We got very lucky, the rain stopped and the sky cleared, so I was able to take lots of pictures of the building with the sun pouring in through the windows, they are a bit arty and technically poor pictures but I like then, and that is what counts. We also stopped at the Swedish version of a 'greasy spoon' cafe. It is a bit different to a UK one. They have apple juice on tap and offer much better food. I finally got my fix of pytt i panne, a fried potato dish, which I've tried to copy but mine just isn't right. It was wonderful, I bet the natives don't see it as a great delicacy. So that pretty much brings us up to date. I've managed to finish the hand sewing on a pretty big quilt today, and we spent the last couple of hours in our hotel room enjoying the cider and watching the TV (OK I was sewing too). All in all a very restful day. So we have arrived in Sweden. It is just as good as I remembered, I love this country. It was scary how little seemed to be growing in the UK when we flew over it, and in contrast how green Sweden is. We have a hire car and as soon as we left the airport we headed for Mias Quiltbod. It was a pretty long way, I think about 2 hours driving, but well worth it. It was great to see Mia again, and I love having access to a new range of fabrics. I did spend rather more than I had intended but, well it is three years since I was here last. On one of our previous visits we had nearly visited Eskiltuna, but then we read the guide book and ran away. The guide had said it was a grim grey industrial town with no redeaming features, and it is the murder capital of Sweden. Not what you would call encouraging is it. However we really needed to drive though it to get from the airport to the quilt shop. So with much trepidations off we went. It is a very pretty town, and we found a nice restaurant there. OK it does have industry, but then so do a lot of towns. I would say who ever wrote the guide book must have just had a bad day when they came through Eskiltuna. If they want to see really grim grey and industrial I am quite certain I can show them worse if they come to England. 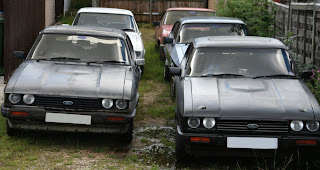 Some time ago I posted about my car, a Ford Capri we refer to as KDU. She recently was declared beyond repair, which I am very sad about. Several suggested I should take some more pictures before I lost her entirely. Finally this Sunday I had time to. I haven't had a chance to work on many pictures yet, and I thought it would be nice to introduce you to the rest of the Capri side of the family. At least most of it, Atew is in the garage waiting for more time to work on restoring her. So in the front we have Cally and Trogdor. Cally is the grey, and has been with us about 10 years. I think we have done over 100,000 miles in this car. Trogdor the black car is our newest arrival. It had a V8 and will hopefully turn out to be a good drag racing car. Behind Trogdor, is Kdu, the blue car. She is my darling but after many years service will soon be leaving. Obviously we will make use of every part we can. Next there is the Great white, what colour do you think that one is. This is our first 2.8i and came to us as a rescue car. She was having a very bad time where she was, the locals were beating her up. This is currently the car I drive most. I rather like the 2.8i, but I am not sure about the extras when it comes to maintaining the car. Finally we have Brute. It was an emergency purchase just after moving house. A weird car, with an external linkage gearbox. It was clunky but I loved it. Shame it was only a four speed box, Capris really do need a five speed box. Brute is waiting at the moment. We aren't sure what is the best route for him. So there you have it, the Capri family. I will post some pictures of Kdu once I have had a chance to sort through them. Well as promised here are the finished lily panels. They are now four separate pieces sitting in my bath. They needed a good soak after all the quilting. I was quite surprised how big it looks off the frame. It covers most of the top of the bed. It's going to get bigger before it is done too. In this picture the stamen don't look as obvious as they do in real life, but the lighting was pretty bad so that may be the reason. I will try and get a better picture when I have it all blocked and dry. Off to go fishing in the bath and get them pinned out before bed. Since I have been blogging I have read a lot of discussions on copyright theft, and there seems to be a growing number of people who feel we should hide our art away. At least until it is older. I've been giving this some more thought recently. My view when I started blogging was that I would show my work until someone abused it. Maybe that is foolish, but I suspect that vast majority of people who look at my blog are honest and not actually looking to steal designs. Also, how many of my designs would be commercially viable if reproduced in bulk in China? Very few I think. I also decided that once a quilt has been in a show there are thousands of people who could potentially copy it, so there is very little point worrying too much about having its picture here. However I don't want any being copied and appearing in an earlier show or the same show as mine. Simple I work to deadlines anyway and by the time I post it here there isn't time to get that same design into the show I have entered. So that is why I post large pictures of my newest work. I want to share it, what is the point in art no one else can see. If you would like to have pictures of my work on your site, do ask and if at all possible I will help you out. If you see my work at shows, and the show allows it, take pictures, enjoy them. If you want to put those on your website, please do, but credit me and if you can put a link back to here or my main site. I love the idea that more people will get to see what I have been making, and the thought that someone liked it enough to show others is great. The only restriction I do have is that others are not allowed to make money from the images of my work. Sorry but I have to try and make a living, and this is how I do it. If you would like a pattern for one of my pieces, ask, I may well write one and I am always looking for testers. Now I had better get this Lily finished so I can show you all of it hadn't I.
I am so thrilled, I've been waiting a while to share this, I wanted to make sure it was certain before telling anyone. I have been given two regular classes to teach at Patchwork Corner. I love the idea that I will be able to see the same people each week and get to know them. I love teaching one day classes but then the people go away and I rarely get to see the finished piece or what they may go on to do with a technique. Now I will. How amazing is that? The last two days I have met most of the people I will be teaching next term, and had a chance to see what they are working on. I don't think any of them hated me and I liked them, so hopefully it will go well. It is quite daunting taking over established classes from another teacher and I hope they will go easy on me while I find my feet. One of the students asked if I was patient. Hmm, that is a tricky question, and I could tell the answer they were looking for was yes. Well I am not, at least not with things and projects. I am actually pretty good with people, but I find they often don't need as much patience as they think. From what I have seen so far most of my 'teaching; will be encouraging people and trying to show them how good they really are. I am sure that will need a lot of repeating, but it is always rewarding when people finally believe you so I am rather looking forward to that. Strangely before I met the groups I wasn't sure I would be able to think of many projects for them, let alone things they hadn't done, and now my head is so full of ideas I don't know what to do with them all. I guess I had better start writing them down, before I forget them, or run out of space in my head. OK, as promised here is a photograph of the latest picture on the frame. It is being built in four parts, so there is a black line between the first two parts you see here. The parts are also not aligned properly yet. This is just how they landed on the backing. Believe it or not this is the first good look I have had at this piece too. It's quite possible you are only a few minutes after me. Weird isn't it. I can only see about one third of this at any given moment. So while I am working it seems very abstract. 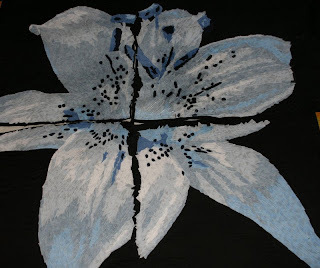 When I am quilting I am looking at the source image to check where the lines need to be as they have to show the shape of the petal. Sometimes it is easy to tell from the change of colours, sometimes I have to make it up as I go along. I've also found that when I work on these large pieces I find it very hard to follow what the design is. It seems to be worse the more I enlarge and image. In this case the dots looked really strange when I was placing them and quilting them. They are up to about half an inch in diameter, so they are pretty big. Far too big I thought, until I saw the photo here. For the longarm quilters here is a geeky fact, this quilt is going from the takeup roller to the top roller. I decided I wanted this to roll right side out and my takeup roller doesn't wind that way, so I am working backwards. It seem to work pretty well as the panels are only about 30" square. Obviously this won't work on big quilts, but for a pictorial piece working from the bottom up does often make a lot more sense. Woo hoo, the editing window seems to have been fixed somewhat since earlier today. Thanks blogger. too, so I am a little concerned I may run out. That would be quite inconvenient. If I can unroll enough to make sense later I will try and get some pictures, if nothing else I want to see it. that keep finding the typos it doesn't understand? I am also finding some spaces vanish when shifting between the two modes, anyone else? the tutor can't remember any of the incidents I complained about. Apparently they investigated at the time I first complained but saw no need to write to me as they couldn't back up my claims. had given them a chance to resolve things before hand. spending several hours helping to unpick tiny tight stitches that are in the wrong place. It's taken over 10 hours to undo 30 minutes mistake. I don't know how I would have done it without you. Thanks. I am just wander a few blogs and I found this interesting posting. It is about making stronger fabric from old thin carrier bags. I think this could be a fun material to work with in quilting, but then I have been considering the possibilities of plastic for a while. It doesn't fray you see so I thought it might come in handy. If you do make anything from it I would love to hear about it. It's been one of those days. Last night I accidentally shut a cat into my longarm room. I don't know quite how I managed it but I did. The cat was very good and stayed away from the quilt, but he did dig up the carpet and block the door. I managed to persuade it and get in though, so it could have been worse. I am very impressed he didn't go on the quilt. When I first got the frame the cats thought it was just so I could make them the best and biggest bed. I put a lot of effort into explaining this was not the case. I guess they got the message. I don't intend to test it too often though. One of the reasons I bought a longarm is I have an old shoulder injury which doesn't like hand sewing and tends to be aggravated by machine quilting large quilts on the domestic sewing machine. Most of the time using the longarm doesn't cause me a problem. You can tell there is a but coming, right, but today I have managed to upset it . I think the quilting was fine, the unpicking wasn't. I think I need to have the frame higher for unpicking than for sewing. I managed to sew a hand size area of small pebble pattern in the wrong place. Took about 15-20 minutes to put it in, an hour and a half to get it out. Tiny stitches overlapping each other are not easy to get out, and boy does my arm ache now. So what do I do next? 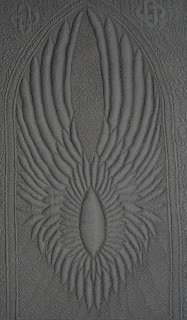 I have too much to do to want to just sit doing nothing, but I don;t think quilting feels like a good plan. I have to draw a couple of patterns but that requires bending down too, and I suspect will be equally bad. Hrumph. Who would have thought a few stitches in the wrong place could be so hazardous. On the bright side the quilt I was working on is looking pretty good and I think I should be able to finish it tomorrow, shoulder permitting. Yes I should be working but I have been quilting solidly for over and hour and I think taking a break will help. Funnily I've been thinking about censorship while I was quilting, and when I started catching up on my email I found a message with a link to this blog. It has several posts talking about censorship in the arts. It's an interesting subject. There seem to be several different camps, most I can understand where they are coming from. The problem is I don't like censorship at all. I think far too many bad guys get to hide behind it, you can't talk about the bad things they do because it would upset others. That isn't a good solution. However I think I might have an alternative idea. Rather than censoring all art, have some events that are only pretty and upbeat. It seems to me things usually work the other way, anything unpleasant is put into it's own space, but then you get a very negative show, which isn't much fun. The world is a mix of good and bad, so having shows do the same would probably be easier to digest. On the other hand there are times when all of us would like to just see the fluffy fun side, so have shows that are just that. I guess it would be tricky to decide what is fluffy enough, but probably no more difficult than removing everything too dark or disturbing. I bet it won't catch on but it's a thought. Now back to that quilt. Today I have discovered two new to me skills. Well maybe one of them is more of a talent. I can upset my normally well behaved longarm on command. Really. All I have to do is load up a large (over 100" wide) quilt that is important. Utility quilts just don't do the trick. The it will refuse to play. Not really what I had in mind for today. I was advised to get the timing tighter, which I have. It sounds bad and I can't believe it isn't breaking the needle but I am getting less missed stitches now. I'd rather have none, and a happy sounding machine, but I guess I haven't got time to be choosy. The other skill I am much more pleased with. I thought I might have finally got the hang of curvy feathers. My small wholecloth has very tiny feathers as it's filler. Of course that might just mean I have figured out miniature feathers, which while nice isn't too useful. Apparently not. They are very organic, which I what I always expected from my feathers, but I do seem to have got the hang of them. I can even go up or down either side. Before you ask, no I don't have any idea what changed. From my point of view one day I couldn't and the next I could. I haven't been practicing them, I just suddenly got the urge to do it and it worked. Neat. I have been so busy the last few days I have entirely failed to blog. I did get around to taking a few pictures though. The black one is a close up of part of the little wholecloth. The finished piece will only be 40cm x 80cm so for me it is very small. The wings were inspired by a pair of earrings, though I am not sure you could tell that from the end product. I know and that's what counts. I also remembered to take some pictures of my speed quilt. 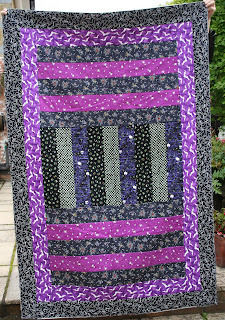 On the black and purple side all the fabrics glow in the dark. It's very silly, but I like it. The other side (it is reversible) is rather more grown up. I hope that having black on both sides doesn't put people off, but I wanted to use fabrics I had on hand with two different themes. These were the first sets I found with all the right amounts in. I guess by now most of my students are used to my colour choices for samples, and are quite happy to choose something that suits them better. The sample is one border short, as when I selected the fabrics I forgot it, then I realised it was quite big enough for a sofa quilt so I left it as is. I could always add another border later if I change my mind as I haven't bound it yet. I've just blocked my small wholecloth quilt, so when it is dry I will be able to get it bound. I am thrilled it is finished as it has been on and off the frame a few times. It was my first attempt at a wholecloth, and at times looked very unpromising. It has definitely been one of those quilts that looks better with more quilting on it. You wouldn't think such a small quilt could take so long and cause so much concern. You can see why I am glad it is pinned up drying. Now I need to get the seat of the chair onto the frame. No rest this time of year. I've managed to end up with three copies of Unlimited Possibilities magazine this month. I know how I managed two but the third is a mystery. Anyway I really only need one so if you would like to have a free trial of this magazine get in touch. Use the contact me link on the right and I will send the magazines to the first two replies I get with addresses. 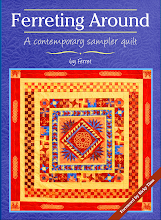 To be honest if you are an experienced shortarm quilter you may find it quite interesting too. Sorry but I don't fancy paying to ship it internationally, it's a fairly heavy magazine. I keep promising myself I will photograph all my work before it leaves the house, but I keep failing. This time it wasn't terribly exciting, but I still intended to photograph it and post the pictures. I guess I will have to go back to the shop with a camera. At the weekend I made my sample up for my speed quilting course. It is a reversible single bed quilt, and I am rather pleased with it. 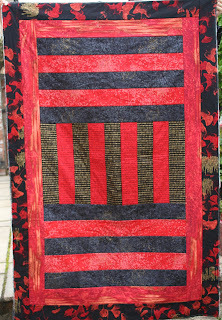 One side is Lonni Rossi Ginko fabrics in black and red, and reasonable adult. The other glows in the dark, as it is made from Halloween fabrics, bats, spiders and ghosts. It's very silly, and a little disturbing when you find it in the dark unexpectedly. 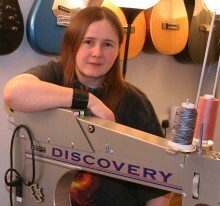 Today I have been being trained up on a couple of Husqvarna sewing machines. It should be helpful when I am demonstrating the Sapphire and get asked tricky questions. I suspect I will still get a lot I don't know the answers to, but at least I can say I have tried to learn about them. I also got to have a play with the Embellisher. It's a fun tool, and I really must find time to play with mine. It has also been a day of paperwork. I've been trying to sort out my entries to the Great Norther Quilt Show in Harrogate, and Scottish Quilt Championship. They've been fairly easy from the point of view of choosing quilts and writing the statements (which I mostly kept to 30 words, I just can't break the rules), but tricky for posting. I've juggled them to be mostly light quilts, which will help the costs, but it is still going to be very pricey. It also says on the forms that return postage will not be refunded, which blows my idea of saying post them then collecting them if I win anything. My current plan is to try and find someone to collect them for me and post them back to me. I have no problem with paying the actual posting cost and compensation for the time taken to do it, it's just that having them all sent back individually is really pricey. I think I will also try calling the show organizers and see if they can help. I guess the forms are designed for people to just enter one quilt which would work fine, so they may be able to do something. I haven't mentioned, and I should have, Grosvenor have greatly improved their quilt handling process. I was pleased to be handed back my quilts unfolded at Malvern, but at Sandown I got to see them taking the quilts down. They handled all the quilts with white gloves, each was taken down onto a covered table then rolled or folded as appropriate. My quilt were returned rolled exactly as I would have done it myself. I guess they have taken on board the feedback they have had. I am really thrilled, there aren't enough shows for us to lose any but at the same time we can't risk good quilts to bad handling. I have been giving clear instructions for each piece so they know what needs extra care and what doesn't. I figure they are trying to help me so it is only fair for me to try and help them. Now I have a little wholecloth on the frame that really needs my attention. Night night.